This Stratocaster Tapped Set has both 1963 and 1961 Fender Spec allowingplayers to switch between the 2 different sets with out any interruption. The first Tap is the 1963 spec. 1963 Pre-CBSset faithfully recreates the last year of full formvar productionbefore switching to enamel. The set is modeled after the originalspecs of 1963 to recreate the last of the formvar warm and woodytones. 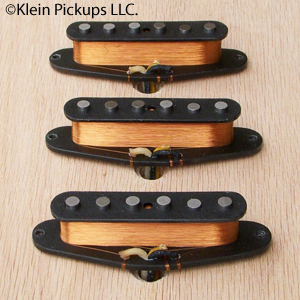 Vintage staggered Alnico 5 magnets with formvar magnet wirebring out the traditional stratocaster tone. Full, round, and very pronounced. Stratty. The second Tap is the 1961 spec. 1961 Fender Spec Stratocaster Pickups,scatter wound with 42ga Heavy Formvar magnet wire, Alnico 5 Vintagestaggered magnets, & black forbon. Great sounding clean, nice& warm with a full crunchy distorted tone. Touch sensitive you canfeel the individual notes melt off the strings on these 61's. This isa medium output set. Wax potted to avoid unwanted microphonics. Wax potted to avoid unwanted microphonics. This set is best utilized with a 3PDT on/on switch.